I don't know which is worse...trying to get my parents our of bed or when they fall asleep in mine. My morning routine usually goes something like this: I wake up around 6 a.m. refreshed and ready to greet the day. I then race into my parents’ room and with unbridled joy begin bouncing on their bed. What do I invariably find? Two giant fleshy sloths snoring away like chain saws. 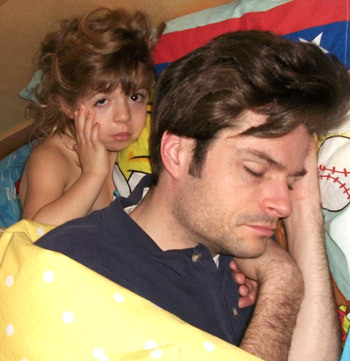 For most of us, getting parents out of bed is no easy task. Heard of a book called Go the F*ck to Sleep? How about one titled, Wake the F*ck Up. Guaranteed, if preschoolers had any income, we’d make it a bestseller. Seriously, parents will do anything to stay in bed … in order to prolong their slumber my mom and dad employ the pathetic trick of asking me if I want to “cuddle” with them. Yeah, right. Snuggle up, as you fall back asleep and drool all over my head? Sorry, I’ll pass. Even if you feel like you could just play in your room and give mom and dad a few extra minutes of sleep, don’t give in. Parents need to understand that the life they had before you were born is over. That means never sleeping in again until the year 2028. Ever. Keep consistent wake up time rituals. One morning don’t try to awaken dad by affixing stickers to his face and another serenade mom with some significant audio from your Leap Frog Leapster. Make sure to wake up both of them same way. It’s only fair. If you can manage to get them out of the sack show them your appreciation by drawing them a beautiful picture of a flowers or a trucks! Then be sure to shove it under their bleary-eyed faces while they’re waiting for their coffee to brew. Take this time to explain to them, in detail, your thought process for color and composition. Do not accept, “Not now” as a response. Who doesn’t like to be awoken to a nice book? Even if you don’t know how to read you can still recite what you remember from your favorite stories. I find the most impaction to be Five Little Monkeys Jumping on the Bed. Works like a charm. Tags: bedtime, parenting, sleeping | Permalink.